Marginal Water: These soil conditions generally result in poor water infiltration, low nutrient availability and poor turf vigor which prevent turf from responding adequately, resulting in increased fertilizer demand. Applying FreeCal as part of an overall salts management program reduces bonds of calcium carbonates and calcium phosphates so that free CALCIUM (Ca++) displaces Sodium (Na+) and other salts on soil exchange sites. 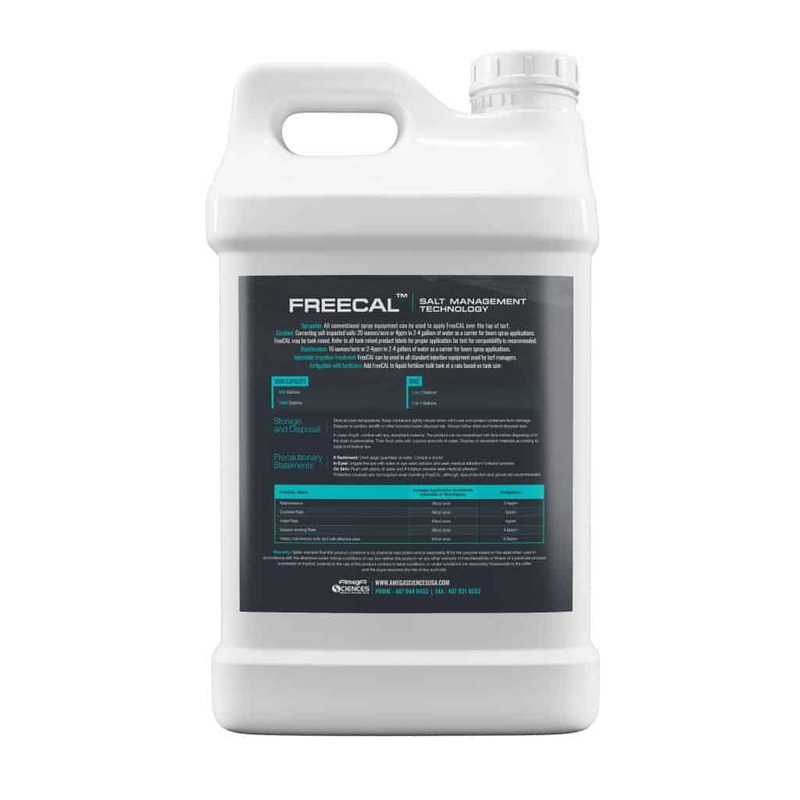 FreeCal dissociates chemical bonds and frees CALCIUM in water and soils under hydration in order to "flush" soils for removing any build-up of salts and to re-charge gravitational and capillary water in most soil types. Water infiltration in most soils will improve and solubility of minerals and nutrients will increase. Increased CALCIUM availability will also buffer soil pH. Soil Nutrient Base Saturation ratios will become more balanced and anions such as sulfates, will stabilize. FreeCal is a soil amendment and it does not contain any plant nutrients nor are there any phytotoxic effects on plants. Sprayable: All conventional spray equipment can be used to apply FreeCal over the top of turf. Curative: Correcting salt impacted soils: 20 ounces/acre or 4ppm in 2-4 gallons of water as a carrier for boom spray applications. FreeCal may be tank mixed. Refer to all tank mixed product labels for proper application Jar test for compatibility is recommended. Maintenance: 16 ounces/acre or 2-4ppm in 2-4 gallons of water as a carrier for boom spray applications. 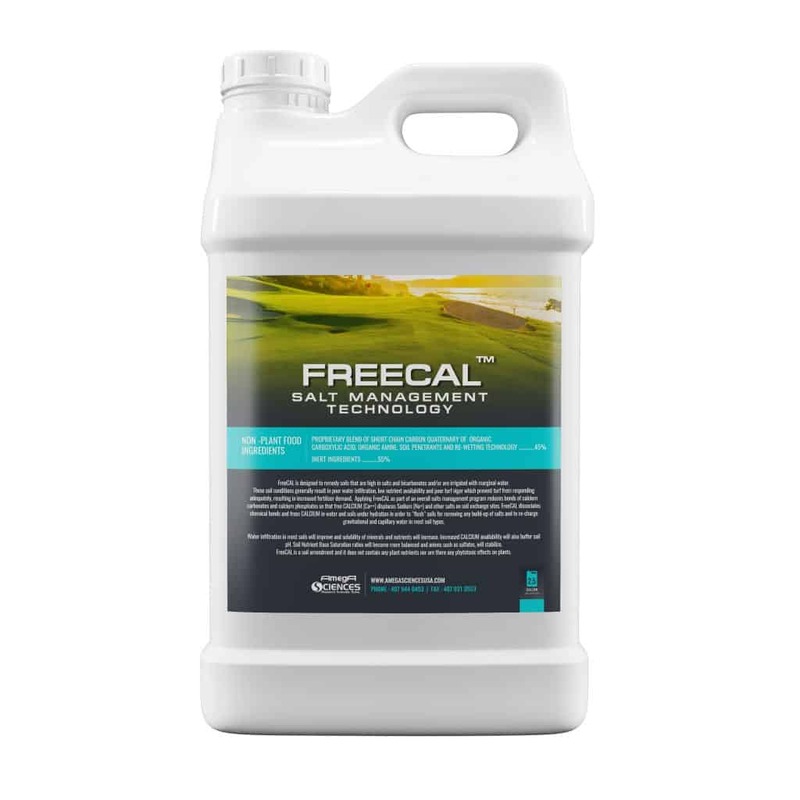 Injectable Irrigation Treatment: FreeCal can be used in all standard injection equipment used by turf managers.